It is 1462 and Edward of York now sits on England’s throne as Edward IV. The Wars of the Roses, though, are far from over. Henry VI still lives and is prisoner to Edward and England’s most powerful nobleman, the Earl of Warwick. Henry’s Queen, Margaret of Anjou, is in exile in France with her son Prince Edward, trying to raise funds and arms to return to reclaim her son’s inheritance. But a more immediate threat to peace comes from an unlikely source. The Earl of Warwick is restless. Despite years of fighting for Edward and the Yorkist cause, Warwick now feels challenged by a new influx of influential men to Edward’s court – the family of Edward’s new bride, the entirely unsuitable and ambitious Elizabeth Woodville. More years of battles will follow, more of England’s royal and noble lines will fall, often under the blade of the executioner’s axe, until only two heirs remain. 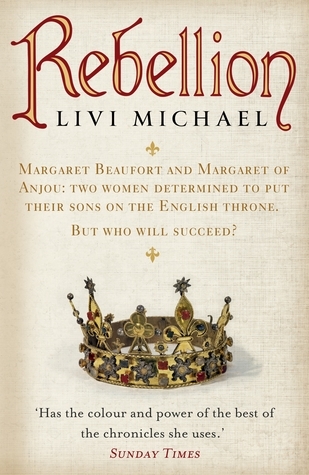 Rebellion focuses on the plight of the mothers of England’s last Lancastrian and Yorkist heirs – Margaret Beaufort, mother of Henry Tudor, and Margaret of Anjou, Queen of a deposed yet divinely anointed king and mother to his heir (and Henry Tudor’s cousin) Prince Edward. Both boys are of a similar age, straining at the leash to escape their mothers and fight for their cause. But there is much more to Rebellion than this. Its scope widens to portray the dramatic lives of Edward IV and his Queen and brothers, the innocent Henry VI, Margaret Beaufort’s unhappy husband Henry Stafford, the indecisive Duke of Somerset and, perhaps most powerfully of all, Kingmaker Warwick and his family. Livi Michael makes effective use of her sources. Extracts from primary accounts are sprinkled throughout, especially at the opening and close of many of the chapters. These are supported by the chapter headings themselves which are well chosen. The extracts don’t interfere with the flow of the story – this is a novel not a history – but help to move along the history of the war on a national scale while keeping much of the drama of the novel itself within family homes, ships, castles, prisons and palaces. This represents a shift from Rebellion‘s predecessor Succession, which, for my tastes, relied too heavily on extracts, distancing us from the characters, and which also presented the perspectives of a cast that grew too large. I should say that Rebellion follows directly on from Succession but both novels are self-contained. The characterisation of Rebellion is well done indeed. None of the women in the novel is especially likeable – thinking particularly of Margaret Beaufort, Margaret of Anjou and Elizabeth Woodville – but they are placed strongly within their time and it’s easy to feel for them with their fortunes ebbing and flowing by the moment. Margaret Beaufort’s enforced estrangement from her son Henry Tudor is gently handled and very moving, as is an astonishing scene on a boat on a stormswept sea on which Warwick’s young daughter strains to give birth amidst the utmost misery and danger. Livi Michael makes good use of male and female characters. This is a novel about a war that has violently split a family in two and it has done damage to all, whatever their gender. Edward IV is a fascinating, flawed character and it’s hard not to feel sympathy for Henry Stafford. While this is a novel about people and relationships, it is most definitely also about war and politics. The Wars of the Roses was a complicated affair, not helped by the multiple marriages and interconnected family lines as well as the overuse of certain names. There are far too many Henrys and Edwards (the novel’s family tree is vital). Nevertheless, Livi Michael guides us on a clear course through events, helped by the use of primary extracts. These were terrible times but they make a fine subject for a historical novel and Rebellion, engrossing throughout, places us in the heart of it all, capturing so well the confusion, violence and uncertainty of the Wars of the Roses as well as the misery it inflicted on so many families. This entry was posted in Historical Fiction, Medieval, Review and tagged Historical fiction, Medieval on August 23, 2015 by Kate (For Winter Nights).